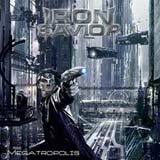 Iron Savior is back with their sixth studio album, Megatropolis. Before I heard this album, I wasn't sure what to expect. Only 2 albums ago, Iron Savior released what is my hands down favorite album of the band, Condition Red. Furthermore, they made a very bold and decisive statement that they can, and will survive without Kai Hansen. Battering Ram, the band's last opus, fell a good bit short of Condition Red's greatness. Naturally, I couldn't expect the guys to top such a great album, but the presence of what I term "filler material" on that album was cause for concern. Was this just burnout after a stretch of four fantastic (the last being a classic, in my opinion) albums, or the beginning of a decline? As much as it pains me to say it, Megatropolis comes with way too many mediocre songs to convince me that Battering Ram was simply an aberration. Sure, Megatropolis has its shining (but not mind blowing) moments, but the indifferent moments are just too much. And sure, a mediocre or average Iron Savior song still beats a lot of what's out there today, but I just can't get past the fact that Iron Savior is capable of so much more. This is the type of album that might not necessarily bore you, but it sure doesn't do much to demand repeated listens. Five years from now, when I have a desire to hear some Iron Savior, I can virtually assure you that I'll reach for one of the band's first four albums, while the layers of dust mount atop this CD. As for the music itself, let me dig into the making of Megatropolis. The album starts off with a classic sounding Iron Savior cut, Running Riot. This is a typical, speedy and catchy Savior cut, but something is definitely lost. Immediately, the sound of the band is not as convincing or inspired as it was in the past. After hearing the entire album, I think some of this has to do with the drumming, which sounds more generic and "safe" to me than on previous albums. Also, Piet's voice isn't anywhere near as convincing on this album as he was in the past. He doesn't sound as "attached" to the songs themselves as he was previously. As for the drums, you have your typical power metal drum fills, with little variation and a lot of predictability. On with the album; The Omega Man is next, and I really enjoy the lead rhythm here. Although the song is more of the mid tempo variety, this one jumped into my memory immediately. Again, the drumming sounds a bit unimaginative, but that doesn't stop this song from standing out. Flesh is a dark, medium tempo track that is a bit modern sounding by Iron Savior standards. That's really a moot point here as the song itself is just pretty stale and not memorable at all. The title track is next, and they guys blast back with a Judas Priest meets Primal Fear track. We're treated to some exceptional guitar work, but the song itself easily passes without leaving the mark that it should have. The chorus is rather ordinary, but the fast guitars and outstanding solos throughout save the day, barely. The dual solo during the second half is certainly a highlight that deserves mention. Cybernatic Queen follows up with a medium tempo, but quite energetic cut. This particular arrangement and lyrical output are probably the most memorable of the album. While still not up to the classic, knock out quality of the band's older work, Cybernatic Queen is a very worthy Iron Savior track. By contrast, Cyber Hero is next, another mid tempo cut. Unlike its predecessor, this song is generic in every way; the guitars, the melody, and (again) the drumming. Some nice soloing can be found midway through the song, but it's just not enough to make the song stand up. A Tale From Down Below is much like Cybernatic Queen. It's another mid tempo cut, but the drumming is more "alive" on the track, the songwriting interesting, and the guitars are excellent. Still I Believe is another track that features some outstanding guitar work, but on the whole, the song just doesn't manage to shake or rattle the listener. It's the type of song that passes by without necessarily boring you, but once it is over, you really don't remember much about it at all. Farewell and Goodbye closes the album, and brings things full circle. Like the opener, this is another speedy cut, but this time with some interesting songwriting that shows up far too infrequently on this album. The chorus is good enough (still not the best the band could do) to stick with you after the album is over, and the guitar work is excellent as usual, with a very generous dosage of solos and shredding to be heard throughout. Despite what I have said above, I don't want to call Megatropolis a bad album at the end of the day. It is certainly a disappointing album by the band's standards, that's for sure. If this were a debut by some unknown band, they certainly would have grabbed my attention. However, the same cannot be said for a band of Iron Savior's pedigree. These guys used to whip out killer song after killer song in the past, with such incredible ease. After time, I think that I began to take for granted that Iron Savior would always deliver an album with mostly killer tunes. This time around, however, they never quite get all cylinders firing at the same time. Excellent guitar work is about the most stable component of the sound, but the songwriting just isn't consistent enough for the album to really get on a roll. As a result, the album as a whole is unfulfilling to me, and it wears thin very fast. That is a stark comparison to past Iron Savior albums that stayed in my stereo for weeks after I first got them, and still get regular play to this date. Megatropolis is an album that will get some play for now, but will quickly fade in my memory, and to the forgotten corners of my CD collection. Largely, Megatropolis is a well performed batch of average to at times slightly above average metal tunes. That's okay for an up and coming band, but it falls way short of what Iron Savior is capable of.